Kreyos was the company behind the Meteor smartwatch, an advanced piece of wearable technology that sought to take on early smart watches such as the Pebble, Android wear, and offerings from Sony, LG and Samsung. The company rose out of an enormously successful indiegogo campaign to fund the Meteor, which raised over $1.5million in august 2013 (%1,502 of their $100,000 goal) and had completely ceased operations by september of 2014. Many backers of the indiegogo campaign never received their Meteor smartwatch, and those who did found it fell short of the promised specs in nearly every category. So what could have gone wrong in just one year to sink a company that was able to attract so much attention from the media, private investors, and crowdfunding end-users alike? Although uncovering the whole truth behind what happened to force the failure of such a promising startup has not proven to be an easy task, the road to the failure of Kreyos and the meteor smartwatch is clearly one paved from the very beginning with misguiding and lessons to be learned. In fact, the difficulty in discerning where exactly the Meteor train leapt off the tracks is the key to the first lesson learned from kreyos’ failure. The company was dishonest and uncommunicative with backers of the crowdfunding campaign from a very early stage. The company’s founder, Steve Tan, even admits to this in his scathing post-mortem “The Rise and Fall of KREYOS.” But the failure of Kreyos and the reaction of its backers has clearly demonstrated that misleading crowdfunding backers, and failing to communicate is a recipe for disaster. Honesty and complete transparency are key, along with frequent updates. A company with so many backers at such an early stage really can’t communicate enough when it comes to its progress, and especially setbacks and delays. Another of the mistake that contributed to this failure, was that the crowdfunding campaign was launched using marketing materials based on concepts alone, the team at Kreyos had no functional hardware or software prototypes to proof the Meteor watch. Without a working prototype or engineered specs in hand, the Kreyos team marketed a concept watch with features that proved impossible or impractical to realize, and represented it to backers as a final product. The Kreyos Meteor, as it was presented to prospective indiegogo backers was a wonderful concept but it was just that, an idea with no engineering to back up its feasibility. The kreyos team’s inability to deliver on the promises made with the meteor was apparent immediately to backers who did receive their watches, and the defensive stance that the company took against angry backers only stood to further harm it. As Kreyos fought to control damage to its image, backers posted complaints to facebook, twitter and youtube, and contributed to documents such as “Kreyos backers lose faith,” coauthored by Andrew Wright and Kenneth Larsen, in preparation for the end. Founder Steve Tan’s attempt to come clean at the end of the project was not particularly well received by backers. It was seen as an attempt to shed blame and wash his hands of the project, rather than further resolve the nightmare situation they were left with. Funding from investors or crowdfunding platforms shouldn’t be used as verification of a products viability. It’s critical that companies prove their concepts independently and seek funding at an appropriate time, after they are sure they can deliver on promises. The final and most critical mistake made, and the largest nail in Kreyos’ coffin, was one made at the very inception of the company and the project. There is no denying that Kreyos would have been a technology company, with hardware and software at the root of its business, yet Kreyos’ team consisted entirely of marketing and customer service specialists and graphic designers, no engineers. All work for the development and productions of the Meteor’s hardware and software was to be completed by a contract manufacturing company. Without an engineer on staff, warning signs as to the fate of the project went unnoticed until it was too late. Contract manufacturing and contract engineering companies can be instrumental to the success of small companies without the resources to hire teams of engineers or spin up rows of factory equipment, but without a single engineer to check the facts and progress of their contractor, the team at Kreyos was doomed to be left holding the bag when the manufacturer was unable to deliver. If Kreyos had employed at least some level of engineering in-house, then they would not have had to rely on the word of another company to tell their backers what to expect and when. The story of Kreyos is a tragic one, rife with opportunities to prevent or lessen the fallout of the companies blunders. The failure of the project makes an excellent case study for others seeking to start companies using crowdfunding or outsourced engineering and manufacturing. By examining the failure of Kreyos and its emergent project, the Meteor, treasure troves of knowledge, much of which may seem like common sense, can be grained about what to do and what not to do when bringing a product to market. It would be wise for those seeking to fund a project on a crowdfunding platform to take heed of the warnings that Kreyos missed, especially now that the precedent has been set for crowdfunders in the US to be held accountable for fraudulent or mismanaged projects by the FTC complaint brought against Erik Chevalier two weeks ago. Chevalier was the creator of a kickstarter campaign to fund a board game called “the Doom that Came to Atlantic City” which failed to deliver either a board game or refunds to its backers. Alois, JD. “Kreyos Smartwatch Called Scam As Backers Demand Refunds or Resolution.” Crowdfund Insider ICal. August 21, 2014. Newman, Jared. “Kreyos Smartwatch: We’re Not a Scam, Just a Trainwreck.” PCWorld. September 16, 2014. Ruddock, David. “Utter Failure Of Kreyos Smartwatch With $1.5 Million In Backing Shows The Continued Perils Of Hardware Crowdfunding.” Android Police Android News Apps Games Phones Tablets. August 20, 2014. Tan, Steve. “The Rise and Fall of KREYOS.” Medium. September 26, 2014. 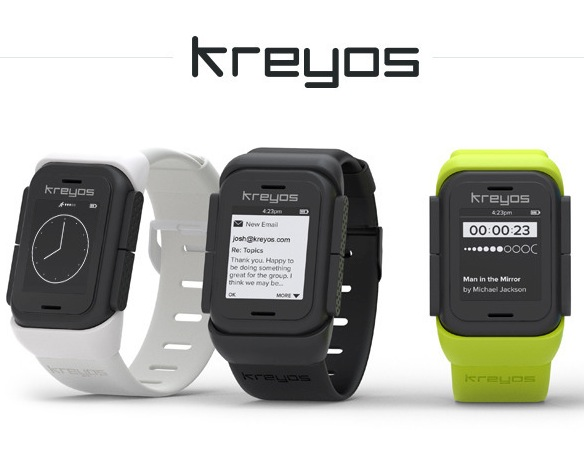 “Support KREYOS: The ONLY Smartwatch With Voice & Gesture Control.” Indiegogo. August 12, 2013.